We're a couple weeks from the decisive day for Election 2012 – meaning no one is exactly sure what the market is about to do. "Once the sun comes up on Nov. 7, all bets are off," Money Morning's Global Investing Strategist Martin Hutchinson told readers of his Permanent Wealth Investor newsletter recently. "After that, U.S. stocks are going to experience a hefty jump in volatility – and possibly a sharp corrective slap." That's a scary prospect for most investors – but it's exactly the type of opportunity veteran option traders hope for. That's because the leverage offered by options can turn only a modest increase in volatility into large profits – and, best of all, with the right strategy, you don't even have correctly guess which candidate's going to win the presidential vote. The "Short Iron Condor," which offers low cost and low and strictly limited risk, but also has a maximum profit. The "Option Strangle," which costs a bit more and has a higher level of risk (though, again, it's strictly limited), but which offers unlimited profit potential. Each of these strategies can be used with individual stocks, broad-based indexes on which options trade or with exchange-traded funds (ETFs) representing those broad indexes. Both will also be profitable on any sizable move in the stock or index price levels – regardless of whether that move is up or down. To illustrate, let's look at a couple of examples, the first using options on an individual stock, and the second based on the Standard & Poor's 500 Index – or, more precisely, the SPDR S&P 500 ETF (NYSEArca: SPY), which is a lower-priced, easier-to-trade proxy for the S&P 500. For the individual stock play, I like Exxon Mobil Corp. (NYSE: XOM), priced at $92.15 at last Friday's close. The stock is sitting near its 52-week high of $93.67, making it ripe for a good-sized drop if the overall market corrects in the wake of the election or if President Obama wins since his policies are generally seen as unfavorable to "Big Oil." But, it could also be poised for a large additional gain if Romney wins since he strongly supports domestic drilling and a reduced near-term emphasis on alternative energy initiatives. 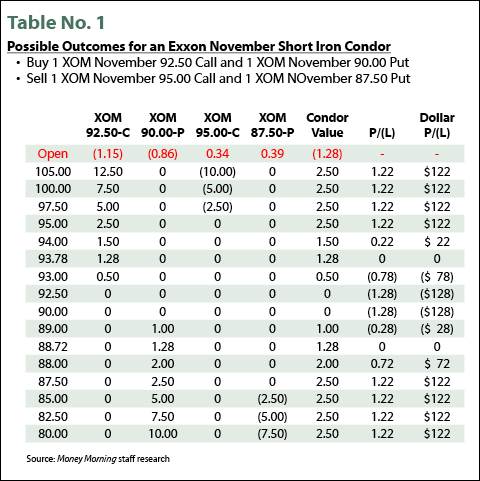 Purchasing one out-of-the-money November $92.50 XOM call option, priced at last Friday's close at $1.15, or $115 for the full 100-share contract. Selling one deeper out-of-the-money November $95.00 XOM call option, priced at 34 cents, or $34 for the full contract. Buying one out-of-the-money November $90.00 XOM put option, priced at 86 cents a share, or $86 total. Selling one deeper out-of-the-money November $87.50 put option, priced at 39 cents, or $39 total. The total cost of the initial Short Condor position is $1.28 a share, or $128 total. That's also the maximum possible loss on the strategy, which would occur at any XOM stock price between $90 and $92.50 a share. The strategy breaks even on the upside at an XOM share price of $93.78 (the price of your long $92.50 call, plus the $1.28 cost of the position). On the downside, the play breaks even at an XOM price of $88.72 (the price of your long $90.00 put, minus the $1.28 cost). The trade achieves its maximum profit of $1.22, or $122, at any XOM price above $95.00 or below $87.50 – the striking prices of the two options you sell. While a maximum profit of $122 per set of options may not seem all that wonderful, remember that it comes with strictly limited risk and a cost of just $128. That means the return on the play, if successful, is a pretty substantial 95.3% (less commissions) – in just over three weeks! And, once again, you don't even have to pick the direction the stock is going to move. Now let's take a look at the Option Strangle based on SPY. This ETF fairly closely tracks the S&P 500 Index, but the shares are priced at roughly one-tenth the current Index value (plus a small premium for expenses) – e.g., with the S&P 500 at 1,433.19 at last Friday's close, the SPY shares were quoted at $143.30. As noted before, this strategy costs a little more and has a higher level of risk, but the profits can be spectacular on a really large market move. 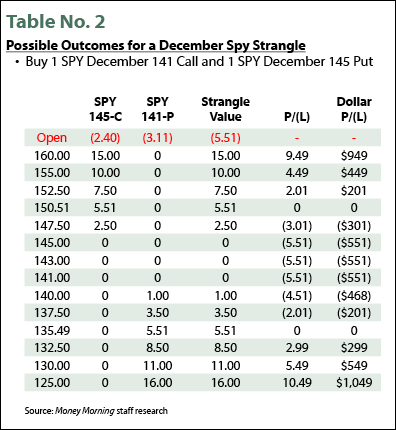 Buy one out-of-the-money SPY December 145 call option at $2.40, or $240 for the full 100-share contract. Buy one out-of-the-money SPY December 141 put option at $3.11, or $311. The total cost for the position would be $5.51, or $551 for the full contracts, and that would also be the maximum risk on the trade. The strategy would break even on the upside at an SPY share price of $150.51 (the price of your long $145 call, plus the $5.51 cost of the position). On the downside, the play breaks even at an SPY price of $135.49 (the price of your long $141 put, minus the $5.51 cost). At any price above or below the break-even points – i.e., above $150.51 or below $135.49 – the Strangle becomes profitable, and the profit is theoretically unlimited, restricted only by how far the market can rise or fall before the Dec. 21 expiration date for the options. Admittedly, those may seem like major moves, but remember, SPY was all the way down at $128.10 as recently as mid-June and it could return there fairly quickly in a major correction – or soar to new highs in a strong renewed rally. As noted earlier, these strategies can be used with a variety of underlying vehicles – from individual stocks to index ETFs – so long as the combination of option premiums paints an attractive scenario over the time period involved, and you can do them with as many contracts as your budget will stand.